This was a surprise project! One of the quilt guilds I belong to, Proper Bostonian Quilters Guild, has a Block of the Month Raffle. A pattern is distributed each month and those who wish to make it, bring in the completed block (or as many as they want to make) a month later. For each block contributed, a member gets one chance in the raffle. The raffle winner goes home with all the blocks made that month. The Block distributed in October was a red and white Churn Dash block--red bars on a white background. This is a classic block, and like many old blocks is known by many names. I usually refer to it as a "Monkey Wrench" block but a piece by Quilting in America lists another 19 names!! "Hole in the Barn Door", "Dragon's Head" and "Quail's Nest" are three of my particular favorites from this list! 9 blocks were in the raffle this month, and I won them. Nine 12 inch blocks is half a lap size quilt. Clearly I needed to make more! I'd been thinking about what I would do if I won. Opposites and Disruption were on my mind! 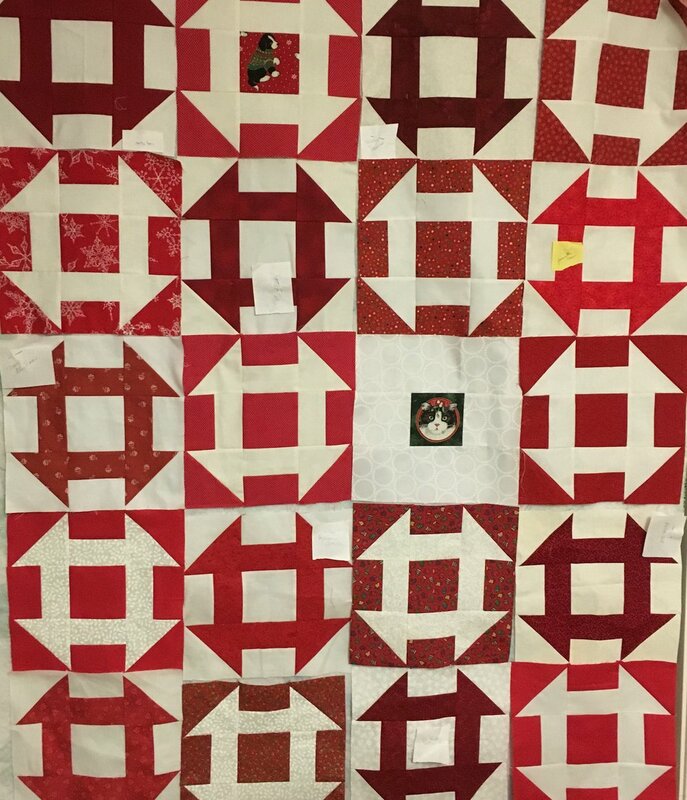 So I whipped up 10 blocks with white bars on an assortment of red Christmas fabrics (opposites) and one Cat in a Circle block (disruption, in more ways that one)! 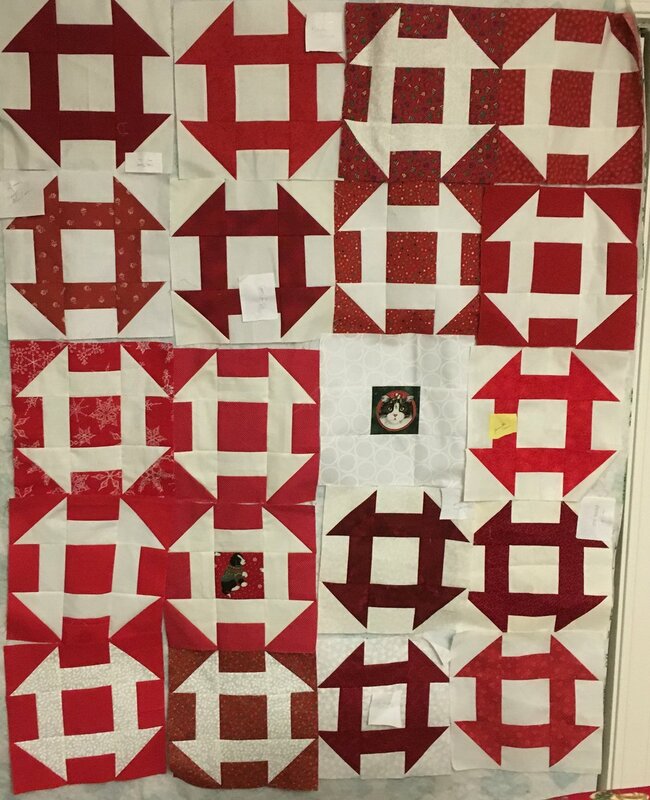 I initially had the quilt on the design wall with alternating red and white background blocks. I sent a photo of it to my quilting friend, Janet. She suggested another layout which was great but not possible with this set of blocks. Nevertheless, her idea got me rearranging the blocks in a variety of patterns, (shown below) before I settled on the final layout (above). This quilt top is active WIP #4! I think that may be a record!